In a video that's been viewed more than 2 million times in one day, a man threatened to call immigration authorities on workers and customers who were speaking Spanish inside a Manhattan restaurant. 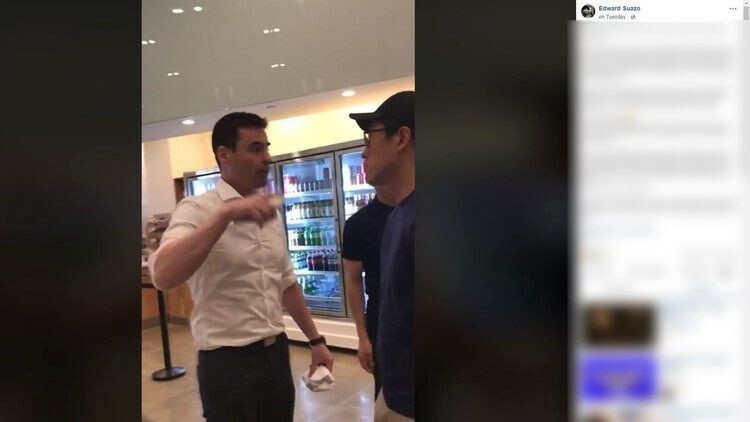 NEW YORK CITY - In a video that's been viewed more than 2 million times in one day, a man threatened to call immigration authorities on workers and customers who were speaking Spanish inside a Manhattan restaurant. Edward Suazo posted the video on Facebook Tuesday afternoon and wrote that his wife and her friend were speaking Spanish to one of the employees when a man started calling them "all types of names and threatened to call I.C.E. on them and the employees." It happened at a Midtown Manhattan shop called Fresh Kitchen, according to NBC New York. "Your staff is speaking Spanish to customers when they should be speaking English," the man in a dress shirt can be heard telling a manager. The manager tried to diffuse the situation by saying that sometimes the workers do speak Spanish. Other customers can be heard heckling the man throughout the video. As the man appears to start to leave, he turned back around and says he's going to call ICE and get everyone deported. "My guess is they're not documented, so my next call is to ICE to have each one of them kicked out of my country," the man says in the video. "They have the balls to come here and live off of my money? I pay for their welfare, I pay for their ability to be here. The least they could do, the least they could do is speak English."